This guide is aimed at potential and first-time visitors and provides basic information and links (click on the Bold blue links) to relevant further sources. Whilst many visitors bring their cars to enjoy the island's uncrowded roads and generally free parking, the island can also be enjoyed using the good public transport network. All information is given in good faith but passengers are advised to check with travel operators for any changes subsequent to the publication of this guide. (February 2014). More information is available on the IOM Government Tourism Website. 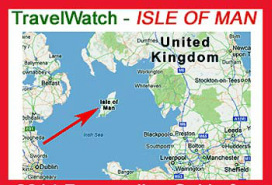 Where is The Isle of Man? In the middle of the Irish Sea, approximately equidistant from England, Scotland, Wales and Ireland. The Isle of Man Steam Packet Company (IOMSPC) operates regular passenger / drive-on car ferry services from Liverpool and Heysham in NW England to the island's capital, Douglas. The following indicates the usual pattern of sailings but please check the timetable for the day you wish to travel. Heysham services operate year round with departures from Heysham Port at 02.15 and 14.15. and from Douglas at 08.45 and 19.45. Please note that Saturday/Sunday daytime services between November and March usually go from/to Birkenhead. Due to vessel maintenance requirements the overnight Sat/Sun service does not always operate. Liverpool (Pier Head) fast craft sailings operate between April and October departing Liverpool at 19.15 and Douglas at 15.00.There are also morning departures on certain days of the week. Liverpool winter sailings (November–March) operate to/from Birkenhead (Twelve Quays) on Saturdays and Sundays only leaving Birkenhead at 14.00 and Douglas at 08.00. Times may vary according to tidal and weather conditions. Irish services (Belfast or Dublin) usually operate up to three days a week between late May and early September with occasional services at Easter and Christmas. Please see IOMSPC timetable for details. is available for passengers at Heysham and Douglas ports – but is not bookable in advance. There is no passenger car park at other Steam Packet ports. Please be aware that weather and other operational reasons may delay ferry arrivals and that, in the event of such delay, connections are not guaranteed. Passengers booking railway tickets requiring travel by a specified train need to allow more than the indicated connection times. Heysham - Northern Rail provide one daily service between Leeds and Heysham Port which provides connections at Lancaster to/from Virgin Trains and First TransPennineExpress for London, Birmingham, Manchester and Scottish services. This service is suitable for passengers travelling to Douglas on the 14.15 sailing and arriving at Heysham on the 08.45 sailing from Douglas. Liverpool – Main line rail services operate to/from Lime Street station – allow at least 60 mins from ship arrival to train departure and 75 mins from train arrival to ship departure (this includes 35 mins check-in time). CityLink Buses CL and C7 (operated by CumfyBus) run between Lime Street station and the Pier Head. Merseyrail services connecting with Lime Street and the Wirral run from James Street which is about 10 mins walk from the Pier Head. Douglas – Buses are the main form of public transport on the Island – with bus stops approx 200 yards from the Sea Terminal. Most out of town buses leave from Lord Street - a map is displayed outside the Welcome Centre and in the public transport timetable booklets . Foot passengers arriving late evening or departing early morning are advised to check bus times before booking. pre-booked hire car pick-up - usually only open to meet passengers who have booked in advance. Be flexible with dates and book as early as possible. Fares vary by season and are dearer at weekends. The TT (motor cycle races) period of late May to early June is peak. On busy sailings, consider reserving seats at £3 each. Special Offer fares are not flexible, but can be amended for a fee. Steam Packet Holidays and other agents offer travel and accommodation packages. Foot passengers have a choice of booking separate tickets for the ferry at www.steam-packet.com (where it is cheaper to book well in advance) and train if required. N.B. some of the cheaper rail tickets are not flexible so in the event of a ferry being delayed the rail ticket may not be valid. Rail (and Sail and Rail) tickets bought direct from train operators websites or at stations do not incur any credit card or administrative charges. Foot passengers may carry only hand baggage on board, but larger items (for which there is no charge) should be checked in at the terminal. At Heysham check-in and baggage collection are within 100 metres and at the same level as the train, although up a short flight of steps from taxi drop-off and car park. A ramped route is also available. There are lifts at Lancaster Station for those needing to change platform. At Liverpool passengers need to take luggage down a sloping ramp from road level to the terminal check-in. Baggage collection for arriving passengers is alongside the vessel after which passengers have to handle their own baggage onto a conveyor up the (sometimes steep) ramp to road level. At Douglas baggage check-in and collection are both at street level. Assistance should be requested at the time of booking as there are steep steps and slopes to be avoided. The island's airport is Ronaldsway, located 8 miles south of Douglas, between Ballasalla and Castletown. In the Isle of Man the walk from aircraft to Arrivals is shorter than at most UK airports, but some steps are involved for departures. Luggage is generally transferred quickly. For details of airlines and timetables, see the airline websites above and for arrivals and departures information check the Ronaldsway Airport website or our Air Information page. Direct bus services to Onchan, Douglas, Castletown, Port Erin and Port St Mary, and limited direct services to Peel. Bus times are displayed on the board in the Terminal Entrance (near the cash machines) as well as in the bus shelter on the front of the Terminal Buliding (turn left on leaving the main door). Bus Timetables are also available at the Airport Information desk. For Heritage Railways timetables see "Public Transport on the Isle of Man" section below. Some tourist information may also be available, and comprehensive information is available at the Welcome Centre in Douglas Sea Terminal. Passengers who have difficulty managing stairs should always request assistance at the time of booking - this would cover getting on/off the aircraft as well as negotiating stairs in airports – particularly departure gates at IOM airport. Book on line, be flexible with dates and book as early as possible. Look out for extras (insurance and baggage charges) which you may not need being added before you complete your booking. The cheaper tickets are not flexible, and alterations incur substantial amendment fees. As air fares are not necessarily related to distance, the longer routes may offer better overall value. Bus Vannin (timetable) provides a comprehensive bus network serving the island from/via Douglas. Heritage railway services usually operate between Easter and early November but with services reduced outside the main tourist season. Explorer runabout tickets, http://www.iombusandrail.info/information.html are available at the Sea Terminal Welcome Centre as well as bus depots, manned heritage railway stations and some retail outlets. A variety of maps and street maps are available on the IOM Government website.